In 1965, Japanese educator Taizo Kaneko wrote to 50 colleges and universities throughout the United States, offering to send the eager young minds of his country to live and learn with American students. Of the 35 responses he received, only one reply - from Willamette University's President G. Herbert Smith - constituted an unconditional and immediate acceptance of his offer. Out of the shared vision of these two individuals, a mutually enriching relationship was born. 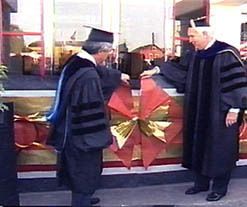 After a quarter century of successful exchange programs between Tokyo International University and Willamette University, that visionary relationship was further strengthened and solidified by the establishment of Tokyo International University of America and the American Studies Program (ASP) in Salem, Oregon. The American Studies Program stands as a solid example of Dr. Kaneko's commitment to students who are unafraid to think, to question, or to see the world around them. As the community of nations races toward the 22nd century, cross-cultural awareness and understanding become increasingly important. Japanese corporations are demanding university-educated men and women who understand the changes and complexities of the world and its peoples. English language fluency and a strong knowledge of other cultures are valuable attributes for young people who seek professional careers.